What? This isn't what you wear around the house when you're baking?! Yeah, me neither. I have a fascination with 1950s style (so this photo shoot was fun), and I actually do wear an apron if I'm cooking for a crowd. But, let's keep it real. I'm more likely to wear it over plaid pajama bottoms and a Ryder Cup t-shirt than a dress of any sort. And heels? Please. If I'm going to spend a lot of time in the kitchen, I'm going to be in socks so that I can slide around the marble floors dancing to my iPod (though I do love these Candyland shoes from Justfab.com). It's no secret that throwing a good theme party is one of my passions, and I always like the menu to reflect the occasion. Sometimes that means matching the type of food to the event (eg, Mexican for a Cinco de Mayo party), and sometimes it just means creating theme-appropriate displays or shapes for classic dishes. For Easter brunch last weekend, I baked some crusty French bread in the shape of a rabbit and Easter eggs. So many people have asked how I made it, I thought I'd post directions. But first, a confession. I would love to tell you that I ground my own whole wheat flour from my organic backyard garden, or even that I started it completely from scratch. I did not. Ain't nobody got time for that. Or at least this full-time lawyer indulging in late-night baking and kitchen dancing doesn't. Nope. I started with a 5 lb. package of Kroger brand frozen bread dough, which I let thaw in the refrigerator for about 10 hours while I was at the office doing lawyerly things. The dough is already separated into five 1 lb portions. It's oblong and boring in the package, and there's no joy in that (though it tastes good regardless of what it looks like). I'd made Santa-shaped bread at Christmas using directions from Taste of Home. The Santas turned out pretty good, so I thought I'd attempt to make bunny bread for Easter. The Santa on the left was my first attempt. For the one on the right, I modified a few things (like twisting the beard pieces) and thought it came out better. I didn't have a pattern to guide me this time, so I just used my imagination and played with 2 loaves of the dough until I was happy with the bunny shape. I used almond slivers for the bunny's eyeballs. I then brushed the entire loaf with an egg wash. To give the bread it's color accents, I mixed a tiny bit of food coloring into the egg wash, which I brushed on top of the dough using varying sizes of small artists' paint brushes. I used a super simple egg shape for each of the remaining three loaves, rolling and pinching small pieces of dough to create three dimensional designs. Again, I used tiny amounts of food coloring in the egg wash to add color accents. I baked the bread at 350 degrees for about an hour, covering it loosely with foil for the last 15 minutes to keep the top from browning too much. A tip: depending on the shape and thickness of your bread loaf, you may need to bake it longer. My egg loaves looked puffy and perfect when I took then out of the oven, but they fell a bit as they cooled because the inside wasn't completely done. I popped them back in the oven and finished them easily enough, but they didn't puff back up so I wasn't as satisfied with the finished loaves as I could have been. Once the bread cooled slightly, I used artists' paint brushes to apply edible lustre dust in various shades to add shimmer and sparkle to the bread. Lustre dust is by far my favorite embellishment for baked goods. It's completely tasteless, easy to apply, and adds unmatched dimension. In fact, I often use it to decorate bare sugar cookies in lieu of icing. It's far less messy and there's no worry of messing up the design when you stack them. It also adds decoration without any added sugar or fat. It can be found in the baking aisle of Michael's or Hobby Lobby, and a single small vial goes a really long way - you definitely need to use a light touch when applying. These gingerbread cookies I made in December have no icing on them at all. The color and shimmer is color-tinted lustre dust; The top photo also has crushed, melted hard candies in the cut outs (the candy melts as the cookies bake, and creates a stained glass effect); The ballet slippers on the left were a big hit for a 9 year old's Nutcracker ballet themed birthday party. So there you have it. If you're feeling creative, try making shaped French loaves the next time you break bread with loved ones. If you have more time on your hands than I do, you might even make your bread from scratch. But, whatever you do, I recommend you forego the 50s housewife high heels in the kitchen and dance around in your socks! Fashion is what you buy; Style is what you BAKE with it! 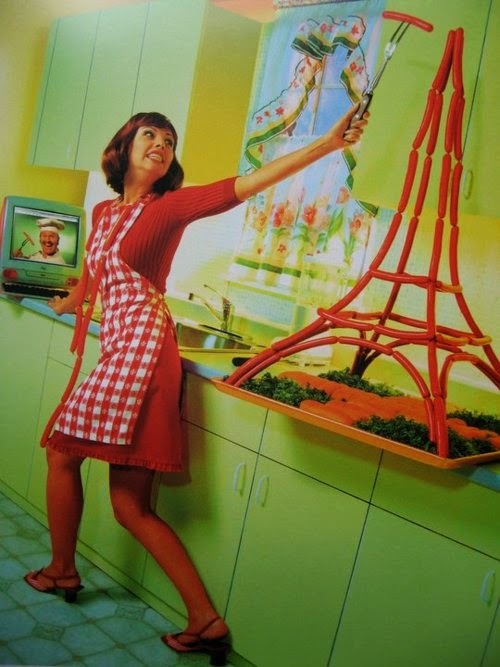 Even I draw the line at an Eiffel Tower made from hot dogs, but it made me smile. Martha Stewart meets Danica Patrick meets Scarlet Johanson. Ha! Well, it's good to be well-rounded :) Thank you - that's quite a compliment. Spectacular! Now I know why you were up so late! Thanks, Crystal! I really love the creative process of it. Wow. That is some fancy-pants baking. (Admittedly, I am a terribly baker. I can cook okay, but I have a tendency to burn anything in the oven.) And I love your '50s outfit! I've actually been looking online today, at Clarence and Alabama. (They're based in the UK.) They have some fancy 1950s dresses as well, and I've been wondering if I should order a petticoat with one as well! Thanks, Dawn! I have a few petticoats in different colors. Some vintage dresses really need them to add structure, but I prefer to keep them on the "lighter" side or they can look costumey. My "Brave New Year" post in early January shows a petticoat look. I will have to check out Clarence and Alabama - thanks for the tip!